This tip is really simplistic, but I'm always amazed by how many people don't know about it. 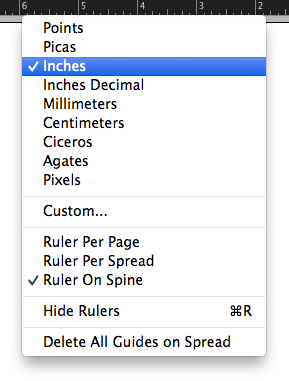 Ever need to change the unit of measure on your rulers in InDesign? Right mouse click (or control-click) on the toolbar and choose your unit of measure from the list. Bonus tip: At the bottom of the menu, there is a command to clear all guides from the selected spread. Much easier than dragging all your guides off the pasteboard.